After smart phones gained popularity about 10 years ago, it didn’t take long for them to end up in the hands of drivers. And since then, we have learned just how dangerous texting and driving can be. In 2016, more than 3,400 people were killed as a result of distracted driving crashes. So why do so many drivers still insist on texting and driving? Often drivers ignore these warnings and continue to use their phones because they’re just not convinced that it’s that dangerous. Or they believe that they are good enough to get away with it and think, “it won’t happen to me”. How many times can someone text and drive and get away with it? There are no real statistics on this but keep reading to learn 5 facts about texting and driving and why it should be avoided. Due to the amount of texting and driving related accidents, almost all states have passed some form of legislation. 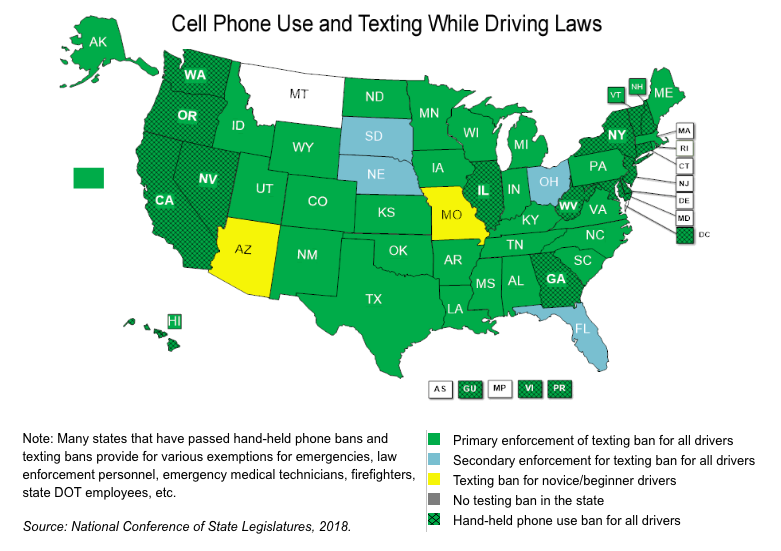 These laws can range from a texting ban for only novice drivers to a complete ban for any handheld phone use for all drivers. The penalties will vary on location so contact your local municipality to learn more about the laws and penalties in place. If you receive a ticket for texting and driving, your insurance premiums may increase as you will be considered a higher risk driver. Also, if you are involved in an accident and there is a record of you texting and driving in the police report, you can almost guarantee your insurance rates are going to skyrocket. When drivers send a text message or look down at their phone for any reason, often their perception is that they are only taking their eyes off of the road for one second or less. In reality, studies have shown that drivers will look down at their device for up to 5 seconds. Now, imagine closing your eyes and driving for 5 seconds. Seems like a terrible idea, right? Also, even if you text at a red light or when traffic is heavy, you can actually remain distracted for up to 27 seconds after using your device or even adjusting the radio. Studies have indicated that text messaging makes a crash up to 23 times more likely to happen. There is no text message that is more important than a life. When you take your eyes off of the road you are risking your life, any passengers in the vehicle, other drivers on the road as well as pedestrians. There are several ways you can avoid a texting and driving related accident. First, remember it only takes a few seconds to pull over into a parking lot. If you think that is inconvenient, think of how inconvenient a car wreck would be. Also, there is hands free technology easily available. Most newer vehicles have the ability to sync with your device so that all notifications will come through your car’s speakers. Drivers then can respond with their voice alone, leaving hands on the steering wheel and eyes on the road. There are also apps you can download to your phone that will automatically turn your phone on silent or temporarily block messages while you are on the road. Looking for a Metro Detroit Collision Shop? Have you recently been in an auto accident and are in need of auto body repair in Metro Detroit?